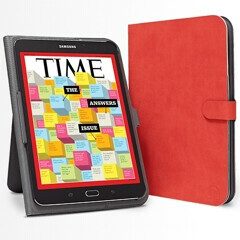 While we're waiting for Samsung to kick off its IFA 2015 press event, we have good news for fans of eBooks: Samsung and Barnes & Noble today launched the Galaxy Tab S2 NOOK, a tablet that - as its name suggests - is based on the previously released Galaxy Tab S2, the thinnest tablet in the world. More exactly, this is the 8-inch Galaxy Tab S2 that we're talking about here. The Tab S2 NOOK costs $399.99, and is presented as "the ultimate tablet for readers." It comes with free lifetime in-store support, up to 20 free eBooks, $5 worth of Barnes & Noble credit, and three free magazines. Barnes & Noble members can buy the slate for 10% off. Specs-wise, the new Galaxy NOOK tablet is similar to the regular Galaxy Tab S2 8.0, thus offering a 1536 x 2048 pixels Super AMOLED display, Android Lollipop, fingerprint scanner, an 8 MP rear camera, octa-core Exynos 5433 processor, 32 GB of expandable storage space, and a 4000 mAh battery. Various optional accessories, including stylish covers, are also available from Barnes & Noble. As you may know, this isn't the first time when Samsung and NOOK are collaborating to launch tablets. Last year, the companies released a couple of slates in the US, the last one being the Galaxy Tab 4 Nook 10.1.